1) It provides an amino acid which help support the body’s ability to increase blood flow. 2) It stimulates the immune system response, which helps the body heal from workouts and physical activity. Remember, muscle does not build in the gym,muscle builds in the recovery stages while the body is at rest or sleeping. 3) Daily Optimizer provides a vitamin which is used by the body to create a neurotransmitter, which is responsible for electricla signaling from the brain to the muscles. 4) It also has a mineral which helps the metabolism of calcium, phosphorus, and magnesium. This helps to build strong bones and maintain muscle functionality. Remember, what good are strong muscles without strong bones. 5) There is an all natural hormone called DHEA in the Daily Optimizer, that helps normalize blood hormone levels, especially those that are responsible for building muscle. As we age our hormone levels naturally decrease. DHEA safely converts in the body into other hormones like testosterone in men and estrogen in women. Women: Take one (1) tablet first thing in the morning and one (1) tablet in the evening before bed. Men under 150 lbs: Take one (1) tablet first thing in the morning and one (1) tablet in the evening before bed. Men 150 to 220 lbs: Take Two (2) tablets first thing in the morning and Two (2) tablets in the evening before bed. Men 220 lbs and above: Take Three (3) tablets first thing in the morning and Three (3) tablets in the evening before bed. Is a mineral needed by humans in trace amounts. Boron has specific biological properties which can assist a person’s endeavor to becoming stronger and healthier. Our bodies use boron to support the metabolism of calcium, magnesium, and phosphorus. Boron is also used to assist in the production of natural steroid compounds and reduces joint pain through reduction of activated COX-2 enzymes. A study done by the Department of Agriculture showed that postmenopausal women who supplemented with Boron daily at 2mg to 3mg dosages reduced calcium excretion by 40%. This means that these women were able to hold on to and use 40% more calcium to support their bone structures which reduces the possibilities of osteoporosis. These biological functions are not limited to just a women's anatomy. Men can expect similar results (without much worry of osteoporosis). Due to the ingredient Boron in our Daily Optimizer, regular use will help enhance a person’s ability to withstand physical activity, recover properly, and relieve joint pain. Is a “biological response modifier” because of its ability to activate the immune system. B-glucans are polysaccharides naturally found in cellulose of plants, cell walls of baker’s yeast and mushroom. However, it is the glucans found in yeast which contain the valuable immune stimulating properties. We use the supplemental form beta-1,3-D-glucan which is derived from yeast. Even though the Beta-1, 3-D-Glucan is derived from yeast it does not contain any yeast proteins. Biochemically, beta-1,3-D-glucan stimulate macrophages activity. Macrophages are immune cells (white blood cells) which have the biological capabilities to devour cellular debris and pathogens. Adding this specific supplement to our product will initiate an increase in immune response to physical activity as well as everyday elevated stress signals. Is a hydrophilic (water soluble) and hydrophobic (lipid soluble) antioxidant which makes it permeable in all parts of our cells. It is an organic sulfur compound that is essential to aerobic life. Alpha lipoic acid contains antioxidant regenerative properties. ALA can regenerate antioxidants vitamin C and E. Due to its antioxidant regenerative properties cells are able to better maintain a healthy state by being protected from free radical damage. Along the lines of antioxidants, ALA increases the body’s production of glutathione. Glutathione is an antioxidant like vitamin C and E that helps detoxify the liver. The liver is responsible for detoxifying the blood, storing of glycogen, protein synthesis, and production of digestive aids. Proper liver function is crucial for a person’s health. Additionally, ALA has been shown to facilitate cellular uptake of glucose. When we combine ALA with the complex or simple carbohydrates individuals may experience better nutrient uptake which leads to overall nourishment. Enhanced nourishment constitutes better recovery and can encourage stronger muscles with minimal fat gain. Is an important vitamin with critical properties. Choline is used by the body to transmit nerve impulses from the brain down the central nervous system, is part of phosphatidyl choline (lecithin), inhibits excess amount of fat in the liver as it aids in fat and cholesterol metabolism, and supports hormone production. The most interesting findings are the biochemical characteristics Choline contains as it converts to the neurotransmitter acetylcholine. Acetylcholine activity may provide positive influence in muscle rejuvenation and contraction. Choline has the capability to convert directly to as well as act on the acetylcholine receptors, thus, enabling stem cell recruitment. When you workout, you damage muscle tissue. This damaged tissue sends out chemical messages which catch the attention of new stem cells. These stem cells flow to the injured area and begin healing it by forming new muscle fibers. When a stem cell recruiter is implemented into a fitness regimen, muscle repair can be enhanced which constitutes greater muscle growth, reduced soreness, and improved recovery. Is a non-essential amino acid which is responsible for initiating several metabolic functions. Arginine is most commonly known for its ability to stimulate human growth hormone production. This biological capacity of Arginine is 100% natural and will not raise human growth hormone levels to supra physiological levels (levels greater than the body would naturally produce). However, as we age hormone levels naturally decline and natural stimulation has shown to have positive effects on human anatomy. Additionally, athletes are always in need of more stimulation as their bodies are taxed more than regular individuals. Therefore, natural stimulation will help meet the demand of the athlete’s body. Growth hormone is a great anti-aging hormone that helps induce fat reduction, increase repair and recovery, and increase muscle mass. Arginine is also a precursor to creatine synthesis. Arginine is one of three amino acids the body uses to make creatine, the other two being methionine and glycine. Another important function of Arginine is its part in detoxifying muscle tissue of ammonia. Arginine converts ammonia to a waste product called urea, which then is excreted by the body. This ammonia detoxification helps reduce soreness. Lastly, Arginine has shown positive effects in stimulating endothelial cells production of nitric oxide. Nitric oxide is a naturally produced gas which induces the blood vessels to dilate (vasodilatation). Vasodilatation increases blood flow. A slight increase of blood flow will enhance the body’s ability to absorb nutrients from the blood into the muscles and increase physical activity. By adding this impressive amino acid to the product, it will help increase physical activity, stimulate natural hormone synthesis, reduce soreness, increase nutrient uptake and enhance overall well being. Is a natural occurring hormone that is primarily produced by the adrenal glands. Its main physiological function (as a prohormone), is to converts into other natural hormones. This is crucial as production of important hormones maybe lacking and thereby creating symptoms such as fatigue, loss of strength, loss of stamina, decreased energy levels, loss of muscle mass, decreased libido and softening of bone tissue. DHEA converts into androstenedione, androstenediol, testosterone, corticosterone, and into estrogen (through androstenedione and testosterone). As we age our hormone levels naturally decrease. This can place a strain on our desire and ability to stay fit. Dhea’s physiological function is 100% natural and will not raise hormone levels to supra physiological levels (as long as the product is consumed according to the labeled directions). The amount of Dhea in the daily optimizer is dosed so adverse effects should be avoided. Dhea however, is not only for those individuals who have declined hormone levels. An Athlete’s body experiences greater physical strain and must maintain adequate hormone levels in order to respond positively to the physical demand. Ingesting DHEA along with the other synergistic ingredients in the daily optimizer (at the suggested quantity) will help encourage correct hormone levels necessary for positive physical effects. Is a proteolytic enzyme which is isolated from Serratia E.15 microorganism that is naturally found in the Japanese silkworm’s intestines. Serrapeptase has been shown to contain the abilities to devour dead tissue, remove arterial plaque, dissipate small clots, and reduce inflammation. By implementing Serrapeptase to the “Daily Optimizer” we can expect physically active as well as inactive individuals to experience reduced joint pain and muscle soreness, a healthier cardio vascular system, an increase in mobility and sense of overall well being. Serrapeptase completes the “Daily Optimizer’s” effective ingredients list, which provides the means for a person to increase their physical performance without steroids and help create a state of optimal health. Warning: Do not use if you are pregnant or nursing. This product may retard blood clotting if you are currently using blood thinning medication. It is recommended to always consult with your health care professional before using. Not intended for use by individuals under the age of 18 years. "My sleep pattern is better now with these products. I run 40 miles a week and the Pure Energy product gives me energy and the Daily Optimizer helps me recover and repairs my muscles. These are healthy products that will enhance your performance." "I highly recommend it. I am very particular on what I put in my body, if it is not natural it is not for me. All of the Cell Formula products have helped me function better as an athlete and as a business women, I work for the Department of Finance here in Canada and my job is tiring and taxing, the better I fuel my body the better I perform. 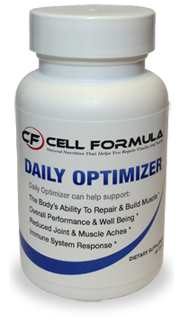 The Daily Optimizer is a great compliment to any type of supplementation program. It helps me to balance my hormones, to rest and get through my days as well as really aids in recovery. After a workout, there’s fewer aches and pains, less inflammation and I can get through my day a lot easier with it." "I have tested these products on myself and on several clients of mine ranging from 80 down to 30 years old. After using and testing the Cell Formula products, across the board everyone experienced improved sleep, better energy and changes in body composition. These types of results in my opinion are monumental." “I am very careful what I put in my body, Daily Optimizer and Pure Energy are all natural and have helped me with mental focus, stamina and endurance during my workouts.